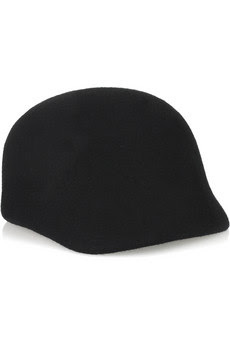 I'm contemplating buying this equestrian style cap by Minimarket. I have an intense love of hats (the jauntier, the better), but refuse to spend more than $50 on them. This one is on sale for $39 at theOutnet.com and therefore falls into my doesn't count as spending money range. Of course, I'm supposed to be getting better and remembering that doing that a few times a month adds up considerably - maybe it's time for another Shopaholic Rehab post? Sigh... anyone out there need a present idea for me? ?